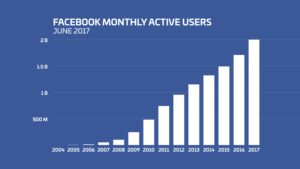 Facebook has 2.01 billion active monthly users. Facebook has 1.66 billion active mobile users monthly. Of Facebooks active users, 53% female and 47% male. The average user has 155 “friends” on Facebook. Since Facebook’s start, the like button has been pressed 1.13 trillion times. 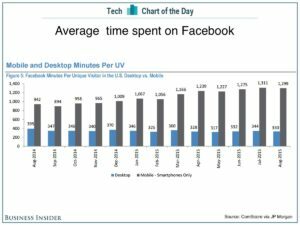 The average time spent monthly on Facebook is 600 hours. Among 18-34 year olds, 48% check Facebook when they wake up. 14.58 million photos are uploaded every hour on Facebook. 243,000 photos are uploaded every minute on Facebook. 4,000 photos are uploaded per second on Facebook. Facebook is available in 101 languages. As of December 2016, 17,048 people were in full-time employment by Facebook. 85 % of Facebook’s users are based outside of USA. An average of 100M hours of video is watches every single day on Facebook. 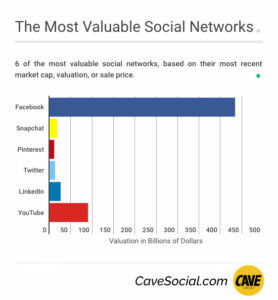 Facebook is the fifth-most-valuable public company in the world. Its market value is around $321 billion. There are 500,000 new users every day and 6 new profiles are created every second on Facebook. 76% of Facebook users log in daily. Close to one-quarter of the world’s population uses Facebook. 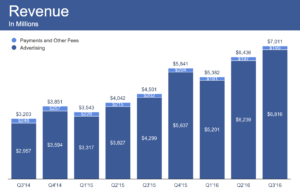 In the Q2 2017 earnings report, Facebook earned $9.32 billion. 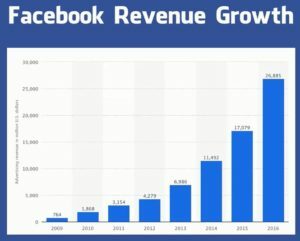 Facebook’s total revenue in 2016 was 27.638 billion. More than 40 million small businesses have active pages. More than 50 million small businesses have active Facebook pages. 16 Million local business pages have been created as of May 2013. This is a 100 percent increase from the previous year. Facebook has more than 5 million monthly advertisers. The average click-through rate on Facebook ads is 0.9%. 40% of Facebook users say they don’t like any brand pages. 49% of users say they like a Facebook page to support a brand they like. Facebook advertising accounts for 80% of the platform’s advertising revenue. 42% of marketers say that Facebook is critical or important to their business. 85% of marketers use visuals in their marketing and 73% plan on increasing their use of visuals. 62% of marketers say that Facebook is the most important social network. Only 42% of marketers feel like their Facebook efforts are working. 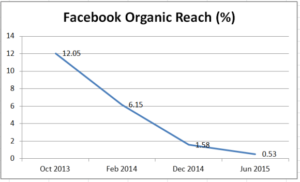 53% of marketers have seen declines in their Facebook News Feed exposure. 64% of social marketers plan on increasing their Facebook ads activities. 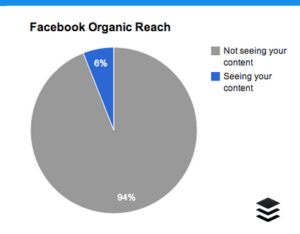 94% of marketers use Facebook. Marketers with less than 12 months experience choose Facebook. 97% of B2C brands use Facebook for marketing. 89% of B2B brands use Facebook for marketing. 68% of marketers plan on increasing their Facebook posting frequency over the 12 months (from 2017 to 2018). 80% of marketers want to learn more about Facebook. 64% of marketers plan on increasing their use of Facebook ads. 39% of users on Facebook like/follow a business page to receive special offers.